Professor Vladimir Janda is one of the biggest contributors to our understanding of nervous systems influence over muscle control. Through his observations he provided original theories that scientists, via improved experimental methods are now able to confirm. These syndromes are characterized by specific patterns of muscle weakness (inhibited) and tightness (facilitated) that cross the body (as shown in the diagram above). Specific postural changes seen in UCS, include forward head posture, increased cervical lordosis and thoracic kyphosis, elevated and protracted shoulders, and winging of the scapulae. 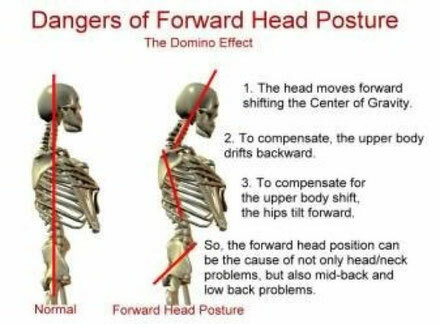 Specific postural changes are also seen in LCS including anterior pelvic tilt, increased lumbar lordosis, lateral lumbar shift, lateral leg rotation, and knee hyperextension. We know that when our center of gravity changes the rest of our body shifts its balance to compensate, below explains how UCS can lead to Layered Syndrome. So how does posture affect my spine? Janda found that the UCS pattern of imbalance caused spinal joint dysfunction, particularly at the atlanto-occipital joints (where the neck meets the skull), C4-C5 segment (mid-neck), cervicothoracic joint (base of the neck), glenohumeral (shoulder) joint, and T4-T5 segment (between the mid shoulder blades). He also found that LCS created joint dysfunction, particularly at the L4-L5 and L5-S1 segments (lower lumbar spine), Sacroiliac and hip joints of the pelvis. Correcting these muscle imbalances through stretching and strengthening can help reduce stress on your joints and muscles and in turn reduce pain. First of all through observation, palpation and muscle testing we can determine whether or not you fit this pattern of presentation. Some patients have different patterns, but that is what we are trained to recognise. Through soft tissue and joint manipulation we are able to help correct muscle and joint dysfunction, but in the end YOU are responsible for your posture and daily habits outside of the clinic. As part of your treatment you will be given home exercises and self help advice to compliment the treatment and help avoid aggravating factors. At The Whitchurch Clinic, as many other chiropractic clinics do, we have an onsite rehabilitation room where we can assist with exercise and posture training appropriate to your specific problems.